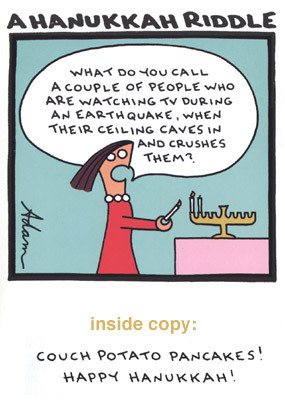 GC008 - Riddle Hanukkah Card: Another out-of-print Recycled Paper Greetings card. This is number one in the yet to be realized Jewish Holiday Natural Disaster Series. Will Tornado Passover ever see the light of day? Feel free to buy something else, in an attempt to feel better.